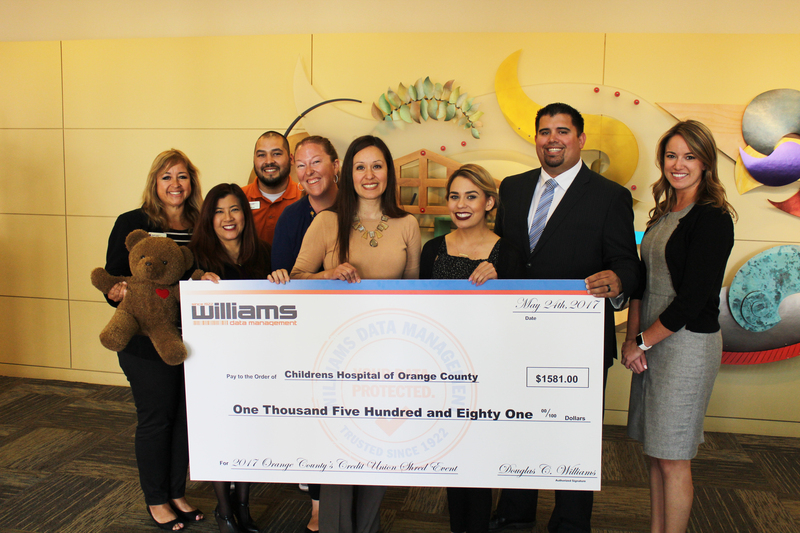 LOS ANGELES, CA, June 12, 2017 – Williams Data Management, Southern California’s leader in Records Management, announced a $1581 donation to Children’s Hospital of Orange County (CHOC). On Wednesday, April 24th, 2017, Business Development Executive Justin Parker presented the check to Allie Reynolds, Senior Associate Director, Cause Marketing & CMNH at CHOC, and Leticia Mata, Assistant Vice President Community Education and Development at Orange County’s Credit Union. The donation was a result of the annual Earth Day Shred Event hosted by Orange County’s Credit Union in partnership with Williams Data Management. For the third straight year in conjunction with Orange County’s Credit Union’s efforts to give back to the community, Williams Data Management offered Orange County residents free access to shredding and recycling services for their sensitive documents as well as E-waste. Williams Data Management specializes in Data Lifecycle Management. Operating in the Records and Information Management industry, it has been serving businesses throughout Southern California since 1922. The company is committed to records management and offers full-service solutions, including physical and digital records storage, document scanning and indexing, certified document and hard drive shredding, product destruction, business continuity planning, and Information Governance programs. Williams holds numerous certifications for data compliance and destruction including SSAE16, NAID “AAA” Certification, and is a member of PRISM. For more information, visit www.williamsdatamanagement.com or call 888-478-FILE. Santa Ana-based financial services provider exceeding $1.2 billion in assets with more than 90,000 Members. Services offered include checking and mobile banking, savings, retirement accounts, and auto, home, and small business loans. For more information, visit the Credit Union’s Web site at www.orangecountyscu.org, or call (888) 354-6228.